With New Year’s Eve just three nights away, you most likely have your sexiest sequined dress purchased to rock with your favorite platform pumps. If you’ve been too busy or overwhelmed this Holiday Season to plan the perfect outfit for the last night of the year, you’re in luck! There is still time to order a dress from Rent The Runway to ring in 2011. If you’re new to this amazing borrowing site, you will soon become an addict! As every New York fashionista knows, you will be photographed at most events throughout the year (even if it’s just by one of your coworkers who loves to post albums on Facebook), so you are always looking for the best new dress and accessories for every birthday dinner, first date, wedding, party at GoldBar, and red carpet event. 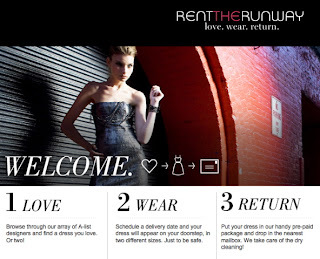 At Rent The Runway, choose from current season fashion from over 95 designers. You can access your favorite pieces for 90% off retail prices. Just enter the date of your event, your size, and the zip code of where you’ll need your dress shipped. As a New Yorker, you can even get same day shipping for $25 if you need your dress for a last minute date with Mr. Right. You will even get a backup size at no additional cost, in case your usual size does not fit correctly in that specific style. The day after your event, just ship your dress or accessories back in the pre-paid envelope that has been provided. No need to stress about dry cleaning! Prices start as low as $50 to rent beauties from See by Chloe, Nicole Miller, Milly & so many more fabulous designers. Invite your friends to join and you’ll receive $20 credit after your friend’s first rental has shipped! If you’re looking to make a purchase on Rent The Runway, there is now a Clearance section with many items available to buy.